Like everyone else, I am disturbed by the economic and social instability in which our world currently finds itself. While the 2008 crash saw us all face a major economic and fiscal reality-check, 2012's landscape will see us move beyond bailouts and credit downgrades to a world where governments and business leaders need to deal with the societal impact of growing unemployment, worker insecurity and an alarmingly widening gap between the wealthy establishment and the common workers (or, as the Americans love to call them, "the Middle Class"). We're already starting to see visible signs of social unrest developing with the "Occupy" demonstrations spreading across the western world. Worryingly, for business leaders and governments, is the fact that there is no imminent prospect of these movements fizzling out. A Double-Dip Recession will exacerbate these issues further and we could be on the cusp of some dramatic and painful changes to the global economic and political landscape. As we stumble towards this increasing likelihood of a Double-Dip Recession, these are becoming highly sensitive times for our enterprises, and none more so for the buyers, advisors and sellers of outsourcing services operating right in the midst of many of these issues. So what are their expectations, and how do they anticipate their respective businesses to be impacted if things take a nose-dive? While most of us are incredibly frustrated with Greek PM Papandreou's decision to turn to his people for their opinion, let's pause for a moment - if your government had mismanaged your economy so badly that you were going to be indebted to the Germans and the Chinese for the next few decades, wouldn't you be feeling a bit miffed? If your CEO was about to sell a major shareholding in your firm to some other entity, and you were a stakeholder in the business, wouldn't you want a say? If your company's board had mismanaged its finances so badly, it feels the need to outsource a whole chunk of its operations to some provider who barely understands the intricacies of your company, wouldn't you want a say? And is the 99% really so ignorant about what's going on that both governments and their business leaders can now operate in a bubble of their own because they know better? Something's gotten broken here, and it may simply be that many of today's politicians and business leaders are actually losing touch with their people. This is an alarming and unsustainable trend, and the outsourcing business could be in danger of getting caught up in the complacency. While news like this will have some advisors and providers excited about hitting their revenue goals, we have to be highly-conscious of the fact that if this data becomes reality, the outsourcing industry is going to arrive at a highly visible and dangerous phase in its development. As we have been at pains to point out - for five years on this site - buyers need to look beyond labor-arbitrage to find any real long-term benefits from outsourcing. However, these issues are going to move beyond buyers simply improving business processes and cutting costs - they are going to become centered on how companies are managing their workforces. Governments are very capable of passing measures very quickly to restrict outsourcing if things get really bad - and they won't have much choice if the 99% demand it. The Bottom-line: Outsourcing professionals need to avoid being perceived as the "1%"
Now, more than ever, the outsourcing industry runs the risk of a backlash, if the worst economic fears are realized in the coming weeks and months. 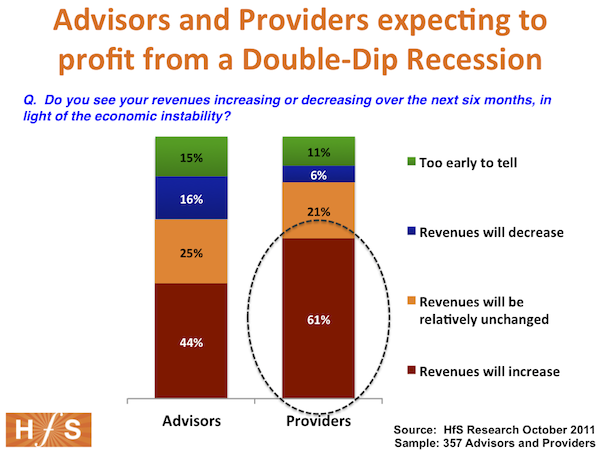 A Double-Dip Recession will polarize governments and most likely paralyze uncertain businesses. Most of you who frequent our blog and research sites make a decent living buying, advising or selling sourcing - and we have a collective responsibility to recognize that the very life-blood of organizations and their employees are at stake in the coming months. And if they fail, we will go down with them. Outsourcing can be a tremendous help for many organizations needing support with improving their processes, globalizing their business operations and accessing better IT, but it is not - and never should be - the only solution to their problems. It should be a vehicle to help companies perform better, to help its staff become more experienced and knowledgeable. All outsourcing stakeholders - buyers, providers and advisors - need to focus, more than ever, on helping organizations approach outsourcing as one supporting component of a holistic solution. In short, buyers and providers need to come closer together to tackle these issues and demonstrate to the world how they are creating value and improving competitive behavior. Phil, great post. And timely. First, the official unemployment in IT published by BLS is 4.1% down from 4.2% a year ago in Sept 2010. But that's an average, and there are locations with higher unemployment - what are those? Second, most gains from outsourcing do NOT come from labor arbitrage, but from adopting a more mature, efficient service model. Based on research I have read, more than 70% of all firms operate under ad hoc models that are extremely inefficient and immature. So, then, outsourcing done right becomes a way to free resources that are already scarce, and everyone wins. The problem is that organizations typically compare an inefficient model here in the USA, with an inefficient (not just because of the distance, but because most still buying staffing) model far far away. I have seen several of our clients stay 100% onshore and achieve 50% savings, and even 70% savings in maintenance costs. 100% Domestic. But very few are even willing to transform how they operate. A Low Cost Domestic (LCD) alternative can achieve immense savings, here and today. But who's looking at that? We've done it. It works. If the client needs global support across time-zones, we can optimize further. Global organizations still need global delivery. But many times the best location will still be home. Anyone interested in exploring LCD? I think we need to raise awareness on the issue of productivity, service models and maturity, and where the savings come from. Bottom line: 4.1% unemployment and growing demands with IT. As a region, you either find ways to become more efficient locally to free up resources that are needed to keep the industry's accelerated demand, or you need to import more from abroad. Looking at service delivery closely, and daring to change how you/we work can make a difference. @Federico - It may be semantics, but: Most organizations do receive their benefits through labor arbitrage. The few organizations that reengineer get benefits that dwarf labor arbitrage opportunities, though the required investments in reengineering are often funded from labor arbitrage. While some proponents of so-called low-cost-domestic-sourcing will argue that they can produce higher value results at a lower cost than offshore options, these solution have serious obstacles. As you've identified, low unemployment creates talent shortages. Spreading the hiring across a country creates a virtual team, which is not as efficient as centralized teams. Few domestic sourcing organizations have the scale to take on the large ADM engagements with thousands of FTEs. The companies seem to be a mix of project-based application development and consulting, lacking the pedigree of CMM level 5 infrastructures and established software development practices. Few have the global scale with any degree of maturity. And, of course, funding these higher cost resources cannot be done with labor arbitrage. Frankly, if your a company looking at domestic sourcing, you probably already have the footprint to source resources in Montana, Kentucky, North Wales, Western Ireland, the Dordogne, etc. Domestic staffing staffing strategies should simply be updated. Very well put Phil. I think the striking thing is that countries and companies are becoming much more leveled. The giant global corporations are stronger financially than many countries. With that power I think inevitably will come social responsibility, whether completely voluntarily or following significant public or government pressure. As an industry we need to provide solutions that at least allows our clients to make the right choices. Pure offshoring is bound to be less attractive whilst onshore farming communities are shifting into poverty and whole cities are descending into ghettoes. Investment in technology arbitrage and the use of low cost onshore centers provides a better social solution and used as part of a global solution may just provide a range of options that helps our socially more sensitive clients do the right thing for their shareholders and the communities they serve at home. Phil, with transaction volumes decreasing in the third quarter in both technology and business process outsourcing markets by seven and 12 percent respectively and average BPO contract values falling by over 50 percent according to the latest research from Everest, I see no reason for complacency. Governments and corporations are scaling back on their sourcing plans as they wait and see what happens to the macroeconomic landscape. I suggest that a churn in contracts where clients seek to drive increased efficiencies by multi-sourcing to specialist providers and a concomitant increase in consolidation are the most likely outcomes for the sourcing market as we move into 2012. The global sourcing industry will need to align itself, as you so cogently indicated, so that corporate social responsibility is no longer something tacked-on to the annual report, but becomes the core belief system on which it relies. Otherwise, the backlash you predict will become an inevitability.